Thank goodness for Fiber Friday. It's given me an excuse to put the pi shawl away for a day or two while I break out some new yarn. Kaffe Fassett has designed a line of sock yarn for Regia. As soon as I heard about it, I immediately ordered a few skeins. I've knit 100's, well, maybe not 100's but certainly a double digits' worth of socks from Regia and I could gush on for days about how inspiring I find Kaffe Fassett. Put the two together & you have magic. I fell head over heels in love with this color-way, which is a little surprising. Dull grays & lilacs aren't my normal choice but in typical Fassett style of mixing colors, the combination is perfect. And beautiful. And oddly calming. I'd bought the yarn with the intention of knitting socks but you know what they say about good intentions. The socks are turning into a scarf. While I was coughing up a lung (this bug my entire family now has makes us feel like we are all 8 pack a day smokers) yesterday and thinking about, but not exactly stressing over, my lack of recent Fiber Friday posts, an idea suddenly came to me for a scarf design. The Regia Ombre Stripe yarn was within reach and onto the needles it went. Meet Viper. Okay, Viper doesn't look like much yet but give me a few days. I think you'll like it. And I really hope I like it. Why Viper, you ask? I was watching Top Gun when the scarf idea came to me. And yes, I know - Top Gun. It was a 'I'm sick & I feel miserable' guilty pleasure. 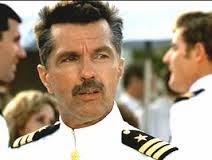 Besides, I love Tom Skerritt. Most females watch Top Gun for Tom Cruise, but me, I watch for the other Tom. And the other Tom's call sign was Viper. So, the scarf will be Viper. At least in my knitting notes. But back to the yarn... It's a little stringy but I think it will soften up once it's blocked. I seem to recall that being the case with most Regia yarns. It's also a superwash yarn which is nice for those times when the spouse surprises me by doing a load of laundry. The self striping factor means you never get bored. The stripes of color are fairly short though and I don't think the striped sock picture on the label is very accurate for this particular yarn. Hmm, maybe I'll have to order more so I can test that theory. Because I really do love the color-way.